So I did a thing. It’s a cool thing, too. Let me back up for a second. A friend of mine has a cinnamon tree. Like, real cinnamon. You peel the bark, let it dry, and BOOM! Cinnamon for tea, baking, sticking up your nose… (just me, then? I’ll move along.) I didn’t know that cinnamon came from a tree at all. I thought it came from a can. Last February, my friend asked me if I wanted some cuttings to try vegetative propagation ( a fancy term meaning: start a plant from cuttings). Of course, I did. She brought me several. I read all kinds of stuff on the internet, but almost no one had any real info on growing from cuttings, so I improvised. I dipped the ends in rooting hormones. One was potted in a plastic bag full of soil. One was in straight water. Another was planted in normal potting soil and set outside. Two died right away. One lingered. For nine months. It never turned brown, but it never grew, either. By that point, I knew I had to have a cinnamon tree of my very own. So where does one turn in times of such crisis? Why, to Ebay, of course. And that’s when I learned how expensive these things are. Like, eighty bucks. For a tree. Yeah. My husband would totally be on board with that. I looked through all the listings, and I found a little six-inch baby tree for $15. It was unseasonably warm for November, but I was afraid we’d have a cold snap and the tree would freeze before it arrived in the mail, so I contacted the seller. We chatted back and forth for a bit, and I realized I had found a seller who wanted me to succeed. So I placed my order. When the package arrived, I discovered that Dave’s Garden hadn’t sent a six inch tree. They’d sent seedlings instead. Five of them. They said a seedling is tougher than larger plants, and they had sent extra so that I had a good chance of ending up with at least one thriving tree. So how does a small, warm-weather, humidity-loving seedling survive in a house that stays 65 degrees in the winter? The only answer was a greenhouse. So I made one. Out of stuff I had lying around the house – specifically, a ten-gallon aquarium, two ziploc bags, some packing tape, and a light bulb. I planted the seedlings and placed the pots in the ten gallon tank. Then I split the two bags along the sides to make a cover to hold in humidity. Then I put the little makeshift greenhouse on my baker’s rack and set it under a regular 60 watt bulb. My set up. The light is over the greenhouse, so it provides just enough warmth to create humidity. Tiny little trees in a tiny little greenhouse. A month or so after setting up the seedlings, and look! The new growth is a beautiful red color. It’s so pretty! And now I’m three months into the project. The trees are growing so well that I have had to peel back the plastic to make room for new growth! And I have five healthy seedlings to show for my efforts. Look at these giant leaves! Aaand it blew the top right off of the greenhouse! What cool projects have you tried recently? And there it is, folks. The sum total of my tomato harvest for this year, and those little beauties are on my vine as we speak. Took this pic five minutes ago. All summer long, the plants grew, but they didn’t bother setting blooms until about a month ago. You know, right after those big rains we had. Apparently tomatoes need water, or something like that. I don’t know. That kind of stuff is beyond my comprehension. So, anyway, tomatoes finally on the vine. Yay, and all that. Here’s the problem. 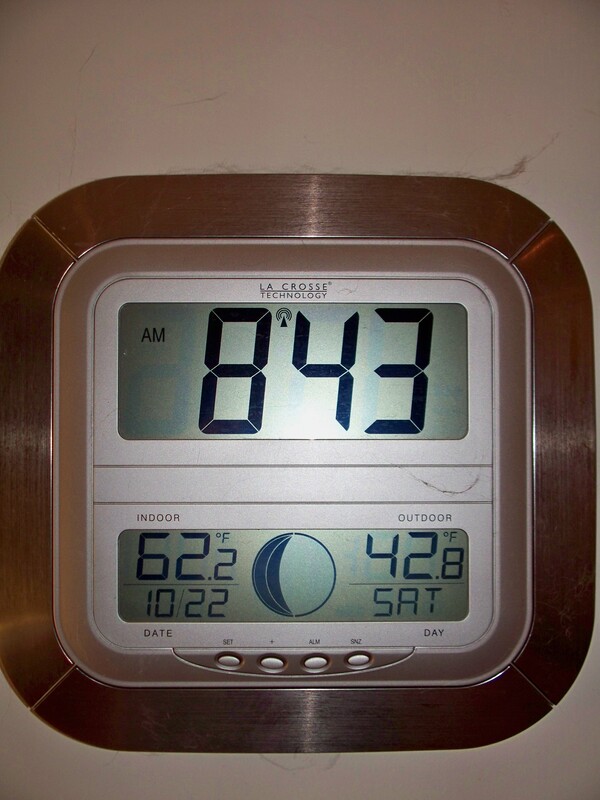 Not the time, though I, too, am stunned that I am blogging at this hour on a Saturday. No, it’s the number in the lower right. It’s a little chilly. Not only for me, but especially for ripening fruit. It’s all over with the first frost. 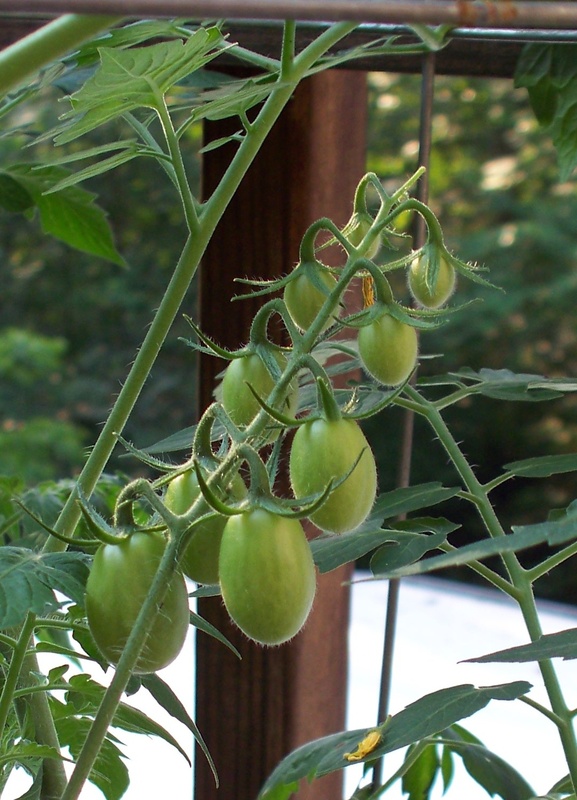 I have no idea how long it takes a tomato to ripen on the vine, but our first frost can only be a matter of days away. I need those maters. Not to eat, of course. I need to harvest their seeds. So I can plant tomatoes again next year. If I remember to water them, we might even get to eat some. Odds are against me. I have been told that if I cover the little babies with a blanket at night, they’ll be protected from the frost. But let’s be realistic. If I can’t remember to water them, what are the chances I’ll remember to tuck them in at night? Not good, I’d say. And the race is on. 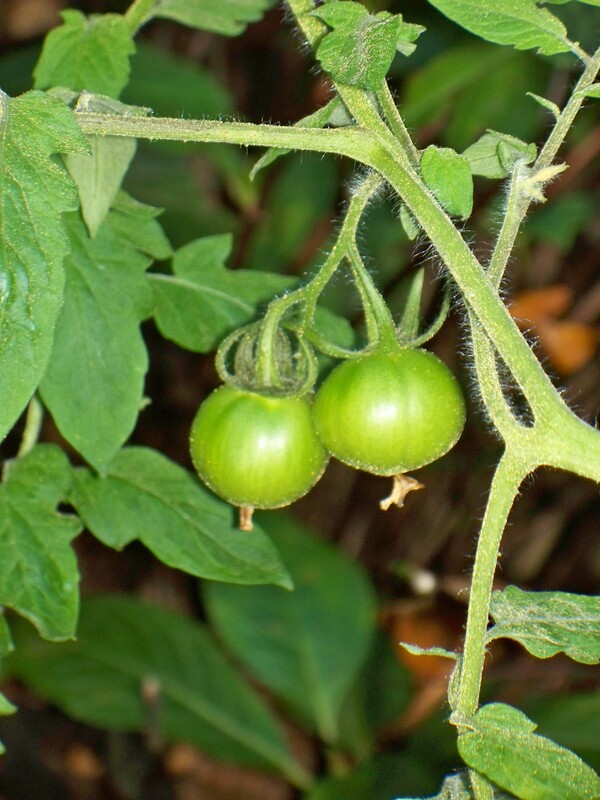 Will my two lonely tomatoes ripen before the frost kills them dead? Place your bets here, ladies and gentlemen. Fruit or frost? Who will be the victor? Adventures in Gardening, Part 2. I Shouldn’t Be Allowed. I have said before that I am not a gardener. Not the out-of-doors, tilling the earth kind. I can grow all kinds of pretty green things in my refrigerator, but I haven’t much skill with tending under the open sky. When I was a kid, my mom would ask me to weed her flower bed. Despite the fact that the kidney-shaped bed was a small one, it would take me most of the afternoon. Not because I was doing a good job, but because I kept coming back into the house to get a drink, go to the bathroom, catch “You Can’t Do That on Television,” you know, basic needs. And when I did get around to it, I yanked off the green parts that I could actually see, and left the rest. Fast forward 20 (okay, maybe 30) years, and that little bed is long gone. Before you get too excited, I’ll just let you know that she replaced it with a bed that spans the entire length of the backyard. This monster is roughly 40 feet long and 8 feet deep. Nifty. And it’s hard to keep up with on your own when your knee needs replacing, so when she asked me if I could help, I said I’d be happy to. And I meant it. I am not afraid of hard work, but I was a little worried. The spirit is willing, but the skill is minimal. My idea of weeding a garden is tying orange yarn on the stuff I planted on purpose and taking a weed-eater to the rest. Mom gave me a basic tutorial on “this-is-weed-this-is-plant” before her appointment. I got it. Or I thought I did. And she made it clear that we weren’t just taking off the tops. We were digging for gold. 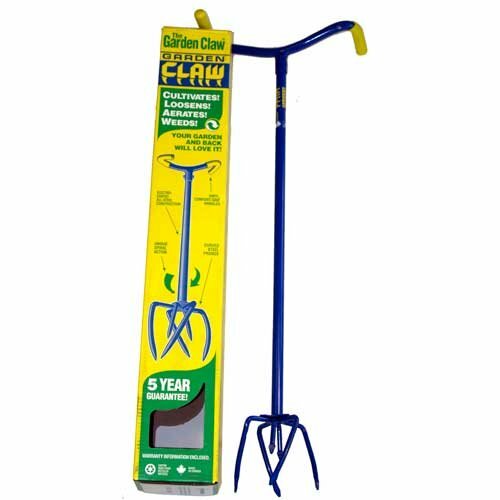 That garden claw was to be used to dislodge every Bermuda grass root we could find. Dig it up, pull it out, throw it away. I admit, I was a little distracted as she was giving me the run-down. I don’t know why. It’s not like a toddler can do that much damage with a two-by-four, right? Or a spade. Or a mattock. Silly me. I should have been paying more attention to the important stuff. 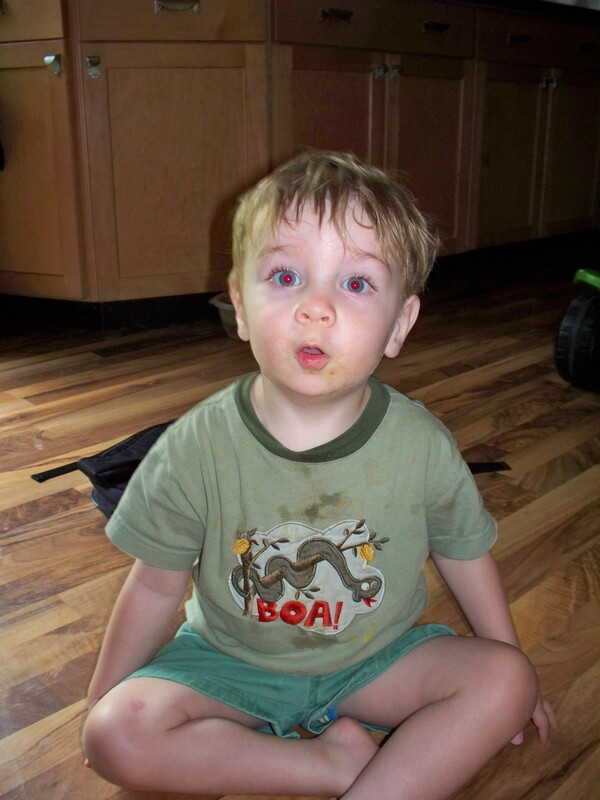 The moment I was alone with a two-year-old and a garden, all of her profound teaching left me. I knew I was up a creek. I did what I knew for sure. I know Bermuda grass. I dug those roots like nobody’s business. But there were other plants I was unsure about, Was that a delicate day lily or a brazen clump of grass? They look rather alike. When in doubt, leave it. My mother returned home to find that I had carefully weeded around the weeds themselves. I did learn something, though. If its roots go all the way to the center of the earth, it is a weed. If it comes up, roots and all, with barely a tug, someone paid a lot of money for it. When my confidence was built (aka, I had a supervisor), I was able to claw with joyful abandon, making rapid progress. I was thinking I might actually finish this patch in one day. Until. I sunk the claw into a particularly think clump of weeds. As I bent down to remove the bits I had broken up, I discovered a toad. Don’t worry. He was whole. But he was scared, and it got me thinking. He was probably not alone in that mass of overgrowth. Seeing as how it would break my heart to uncover parts of toads, I was going to have to take the heavily grown parts by hand. Oh, joy. I didn’t finish that day. Or the next. And we’re still not finished, but we’ll be back at it as soon as the weather clears up. And I think I’m getting kind of good at it. It’s relaxing to break up roots and follow them by hand back to their evil source. I’m sure I made a few mistakes in my zealous efforts, but as long as hydrangeas don’t actually need a taproot, it will all be fine. 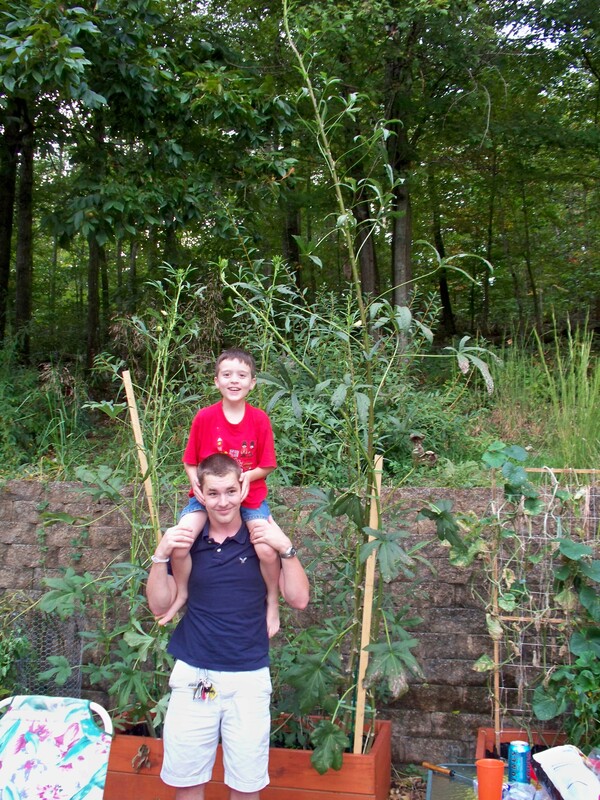 Tallest okra plant in the world. The woman knows how to garden. I am not a gardener. I can grow things in pots to beat the band, but an actual garden is beyond my experience/capability/attention span. And this is one area in which I am in no danger whatsoever of becoming my mom. She loves to garden, and she spends a great deal of time planting, seeding, researching, mulching. She spent my entire childhood trying to tame the wild undergrowth on the bank in her backyard. A few years and a backhoe later, she has the garden of her dreams. And a knee that needs replacing. That’s a bad combo, if you didn’t already know. Last week she asked me if I’d like to come help her “get some weeding done” and get the plants to bed before the first frost. She’s not as fast as she used to be, and there are some things she just can’t do right now with her bum knee. I would rather stick a garden rake in my eye than tend my own garden, but of course I was happy to help her out. There’s just one complication: Mr. Squish. Who? Me? I not do nuthin. Where I go, Squish must follow. Sounds like it would be no problem at all. Small child, large fenced yard, what’s the issue? If he was an ordinary youngster, he might play happily while I worked. Ordinary, he is not. Creative and with a nose for trouble, he is. Throw a cocker spaniel with barely two brain cells to rub together into the mix, and you’ve got yourself some fun. Scream loudly for small child. Locate him indoors playing with the remote control. Bring him out of doors. Remove can of insect spray from his hands. Place small child in pebbles with toy dump truck. Remove pebbles that he has buried in the very, very bottom of the raised vegetable garden. Begin to hand-weed a tricky patch on hands and knees. Remove skunk-breathed dog from face, repeatedly. Attempt to convince her I do not wish to give her a kiss. Return to hands and knees and commence to weed. Feel sudden weight on back as small child becomes “baby gorilla” and asks for a ride. Crawl to compost barrel to dump weeds, so as not to disturb baby gorilla perched between shoulder blades. Remove skunk-breathed dog from face. Remove child from back and take him back to the rocks to play. Notice sudden movement out of the corner of eye and move just in time to avoid small child slam-dunking rock the size of a dessert plate directly on my head. Scream at skunk-breathed dog to get out of my ever-lovin’ face and beg child to quit bouncing on my kidneys. That was all before Squish discovered that the five foot retaining wall is an easy climb. And Mom wonders why I didn’t get much done. I think I remember why I don’t garden.